Over the last few months, I’ve been looking into various enterprise innovation programs to discover some of the secrets behind their market success. In my searches, I came across a recent Global Innovation 1000 study by Booze & Company that found the top 10 Most Innovative companies outperformed the top R&D Spenders in several key financial metrics by a significant margin (see chart below). The reason for their success? Strong Strategic Alignment + the Right Culture enabled these companies to form a lean and smart innovation engine throughout their organization, ultimately leading to exponential growth. 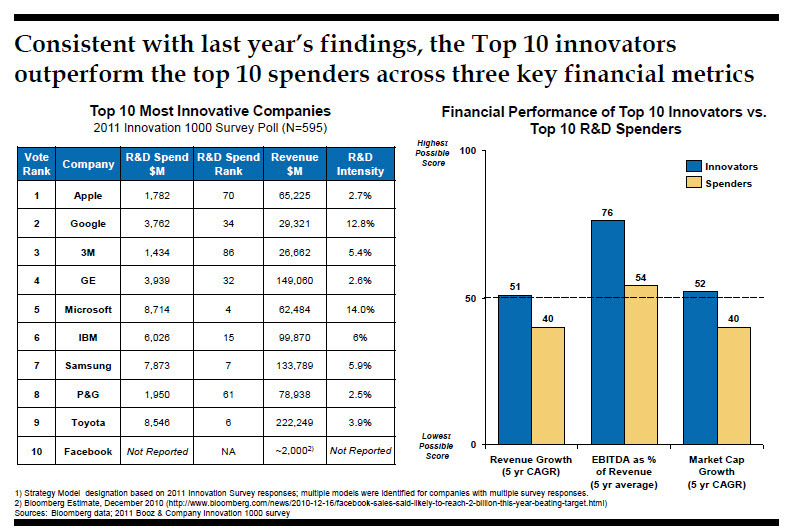 The top 10 Innovators beat the Top 10 R&D Spenders in all major financial categories. Currently, P&G estimates they have the ability to reach 4.4 billion people with a mission to help each of these consumers use P&G’s extensive line of products in order to improve their customers’ and community’s everyday lives – no small task. With such an extensive charter, how does McDonald and his team enable their organization to succeed? For starters, P&G employees are given dashboards with the right real-time information so they can make agile decisions. Social media also plays a big role – from key staff swaps with some of the most prolific social enterprises to major distribution of their most prominent global campaigns (the recent 2012 Olympics Best Job in the World being one of their latest). Most importantly, ensuring they have the right consumer insights by studying specific market conditions through various product competency centers (Shaving Center in Boston discovered intricacies of shaving conditions in India versus the U.S.). 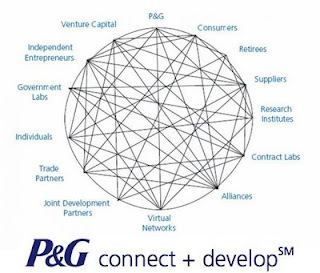 P&G spends around $2 billion annually on their innovation programs – an investment that McDonald admitted, “could be ‘plussed up’ by developing a better architecture for accessing it.” He went on to point out that smart innovation programs are “about who as much as what you are doing.” The company has a well established, centralized, virtual collaboration platform to engage in various ideas with outsiders. 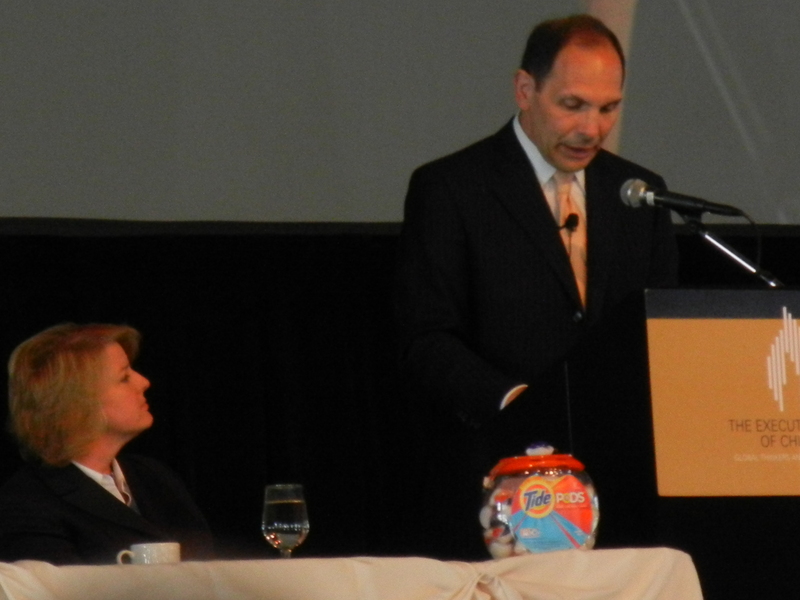 McDonald emphasized the importance of getting insight and feedback from both the inside and outside of companies. Looking ahead, P&G’s will be bringing their innovation and marketing programs together to improve the overall impact of existing and upcoming acquisitions in the marketplace. McDonald and his team are also spending more time on college campuses (nearly every three months) to maintain a strong pulse on the needs and desires of the next generation as well as recruit them into their ranks. This week’s mental sticky note: make sure you’ve got a personal learning development plan mapped out. Not only what you want to learn, but from whom you hope to learn that will spur the next phases of your innovative thinking forward. What’s on your LDP?